No extra duty to pay which was great. It's very early days but I have to say the quality is quite impressive considering the price. While not as solid as my Retevis RT-82, it has a good feel to it and It's also smaller in size. The screen is not as good as the RT-82 but is very usable. Both my Retevis RT-3 and this new radio can use the same charging base so that's a bonus. Programming software is basic but it works. If you can program a TYT or Retrevis DMR, this shouldn't be too much bother. So far, I've programmed a couple of analogue repeaters and one of the DMR simplex frequencies. The basic DMR channel setup (Amateur UHF DH1) works with my Retevis RT-82, my RT-3 and the GD-77 so at a basic level, it's compatible. More to test but so far, for just over $100 delivered, it's an absolute bargain! Does it have better ears than your RT-82? Admiral wrote: Does it have better ears than your RT-82? It's better than my "first" RT-82 but my replacement is spot on now. kilimax wrote: It's better than my "first" RT-82 but my replacement is spot on now. On the RT82, do you get a loud 'pop' at the start of the audio when receiving DMR? Mine does this, and my old MD380 did it too. It's particularly distracting when a station is dropping in and out of repeater coverage (even though your reception of the repeater is solid) because you get pops all over the place, not when the station drops out but when it comes back again. Paul has also got his GD-77. Yes, it does do that, as does my RT-3 and most other stations, even listening via the DV-Mini. I hear this often. Most likely just the digital equivalent to drop out and receiver reacquiring the signal. Admiral wrote: Paul has also got his GD-77. Broadly in line with what I have found so far. BK wrote: On the RT82, do you get a loud 'pop' at the start of the audio when receiving DMR? Mine does this, and my old MD380 did it too. It's particularly distracting when a station is dropping in and out of repeater coverage (even though your reception of the repeater is solid) because you get pops all over the place, not when the station drops out but when it comes back again. OK, thanks for that. I can't believe the likes of Motorola would do this, it should be an easy problem to solve. I don't recall my SDR dongle ever doing it. I don't have access to a Motorola here to test so cannot comment. I tend to find the popping sound is most audible when listening through one of the DMR repeaters. I don't get anything when using simplex but again, signals are strong both ways so there's no drop out. Anyone thinking of buying one of these, Amazon have them in stock. For £77 delivered, I've ordered another one to play about with outside of the Amateur bands. Just picked one up myself, great little radio for the price. Does anyone know if this radio does proper dual receive? i.e. will it hear both VFOa and VFOb at the same time with either 2 analogue freqs, 1 analogue and 1 digital, or 2 digital? Someone I know locally has gotten one of these recently... previously they had an FM baofeng. Now with it he comes out stronger than ever before, signal screaming through the walls. Albeit this is with FM. 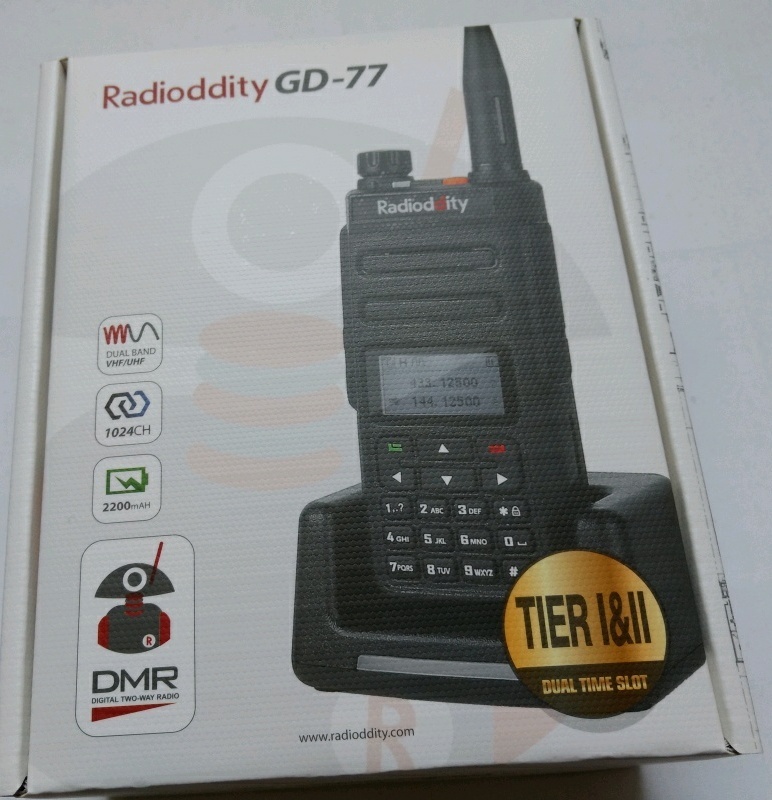 I purchased a GD-77 and think it's GD radio. It's codeplug data format is not compatible with the the much more popular MD-380. The DG-77 requires receive groups in addition to contacts. This significantly complicates programing. Even worse, you can only have 16 receive groups which may be less than the number of contacts. If you place several contacts in a single receive group, you'll be listening to several TG's at the same time with no way of differentiating the dialogue from each.